EAW has announced the launch of the first two products in the next-generation Avalon by EAW line of dance club loudspeaker systems. The line was co-designed by legendary dance club designer/owner John Lyons, whose Avalon Hollywood club is a favorite performance venue for world-class DJs. Lyons worked with EAW in the late 1990s to produce the original line of Avalon loudspeakers. The announcement was made by EAW President Jeff Rocha. Avalon by EAW represents a departure from all previous dance club loudspeaker systems, putting cutting-edge acoustical technology in a package that appeals to the design-conscious dance club market. The industrial design turns the loudspeaker inside-out, mounting the exposed mid/high horn in front of the grille. And the concave grille – sculpted in clean, straight lines – expresses the bilateral symmetry that unifies the design. The products released include the CLUB.two and CLUB.three. Each is a three-way system using a horn-loaded, ultra-efficient, coaxial mid/high compression driver. The CLUB.two includes four 12-in LF cone transducers mounted in a vertically and horizontally symmetrical pattern and axially aligned with the mid/high section. The CLUB.three uses a single, powerful 15-in LF cone mounted in a triaxial configuration behind the mid/high section. In both cases, the symmetry allows for the application of slight mid/high delay to produce an apparent unified origin, as if output across the entire frequency range were originating from a single point. 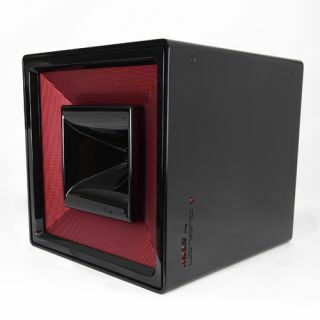 EAW has used a similar technique in a single plane across their product range for many years, and Avalon by EAW takes the technique to a new level of output and performance. Avalon by EAW also sets a new benchmark for fit and finish in the pro audio space. The products are available in a range of color and finish options. “There is no such thing as a ‘standard’ Avalon by EAW,” Rocha said. While base-level products can be ordered in traditional, textured black paint, customers must specify the powder-coated grilles in Siren Red, Medallion Gold, Starlight Sparkle Silver or Machine Grey. The horns and a surrounding trim piece may color match the grille or may be Piano Black. Beyond that, customers can upgrade to a high-grade, automotive finish for the enclosures, choosing from Piano Black or Polar White. These finish options caught the eye of many attendees at ISE in Amsterdam in February 2012, where Avalon by EAW received a special preview. “It might have been the most photographed display at the whole tradeshow,” Rocha said. Because Avalon by EAW goes so far beyond any existing dance club loudspeaker system, Lyons and EAW have decided to set a high bar for access to them, requiring a design proposal to be submitted and approved before an order can be placed. All design proposals will undergo review by EAW’s Application Support Group (ASG). Proposals can be submitted as anonymous venues, ensuring confidentiality to the club design community. Each proposal will receive a registration number to track the project as it proceeds. As necessary, ASG will recommend revisions to the design proposal. After approval, customers can select their colors and place their orders, including the project registration number. EAW will check the order against the registered proposal to ensure that all necessary equipment is included. Once the installation is complete, ASG will inspect the installation and assist with the commissioning process.